As you may know, after guest blogging with Clare at Fashion Femme for nearly a year, I decided I wanted to take the jump and do it by myself! This beautiful fragrance opens with spicy, green and zesty notes but then makes way for the passion of the heart notes... enhanced by jasmine and beeswax, the orange flower absolute reveals its opulence and stunning sensuality. The base notes are my favourite due to a deep intensity from Seville Lavender and frankincense. 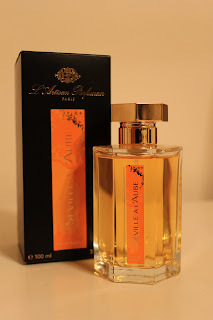 I previously worked at l'Artisan Parfumeur, and I know how this scent made men and women weak at the knees, so you would do well to have this in your collection! This is not to be sniffed at (see what I did there? ), so please click to follow me on bloglovin or GFC, and when I get to the magic number, I will be doing a good old fashioned 'pull a name out of the hat' ! Already following or I could again! At this rate the perfume will have an inch of dust on it. Hate starting out from scratch!! Thanks! Now following you on bloglovin too! Love Mondays FOTD! Thanks! If you don't know where to start, you should really pop to the Covent Garden store for a fragrance profiling session!